Increase your knowledge about birds: This page includes information about basic bird biology including vocabulary, seasonal movements, habitat and life needs, and unique characteristics of birds. What do birds need to live? Clean Water - as with all living things, clean water is important to the survival of birds. Through respiration and excretion, birds lose large quantities of water. These supplies must be replenished through drinking water or nectar, and through feeding on mammals and insects (whose bodies also contain large quantities of water). Clean Air - Clean air is as important to the lungs of a bird as it is to us. Pollution in the air may cause problems for birds such as difficulty breathing for adults and for young. Indirectly, air pollution may have an impact on birds through reduction in food resources. Food - All living things need food to survive. Food replenishes body fuel and nutrients needed to grow and live. Shelter within their habitat - Shelter is especially necessary in the winter, but you could argue for shelter at any time of the year. I am sitting in the shelter of my home right now. Space to move around - movement for food and resources, for finding a mate, for finding shelter, are three examples of movement necessary for all living things..
All living things depend on the environment in one way or another. The most important things that the environment gives us are food & water. While plants are capable of producing their own food animals like birds have to go in search of food (Centre for Environmental Research and Education, 2012). 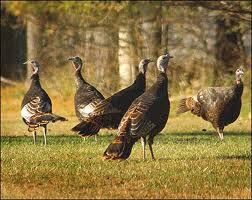 Wild Turkey hens move together in search of food. Interpreting environmental studies in the curriculum is all about making connections. Strive to associate the subjects that are being taught with environmental topics to create a fully integrated curriculum which promotes environmental literacy. Try these ideas below for your next class. Chemistry: What is clean water anyway? Biology: Where can birds get their nutritional needs? Geography: Where are these habitats? Social Studies: How do people affect their own environment? How does this affect different species of birds? Math: How much space does a bird need to forage for food? One acre? Two? Technology: Can we track where these birds are going? Biology: What are the benefits of skeletal adaptations? What about feather composition? Physics: How does the bird stay aloft? Math: Does the velocity of the wind affect the flight? Art: How does a flying bird look from the ground? What are field marks? Please be patient while the Bird Biology program loads below. How do we identify birds? When you are first starting out, it may seem overwhelming to try and identify the birds you are seeing. Use the steps below to make it a little easier. First, take a look at the size of a dollar bill. That is six inches long. How about a piece of paper? That is eleven inches high. Did you know that a House Sparrow (6-inches) is as big as that dollar bill? Did you know a Robin (10-inches) is about as tall as that piece of paper? Using these new size guidelines, try to gauge the size of the bird you are looking at. Make a note of the size, it will help you later. Next we will look at the habitat the bird is in. Is it a forest, a field, along the edge of the water, or along the edge of a parking lot in a suburban neighborhood. This too is important information. Now, onto the bird at hand. Look at the colors, face markings, wing markings, or even leg color. What does the beak look like? Is it singing? What does that sound like? Where is it standing: on top of the tree, eye level, or on the ground? Take as many notes as you can. Write them down before you forget them. Once you look at pictures you will need to refer to your written notes. Finally, look at the bird guide, or google for the bird using your notes. You could look up images for a: red bird in my backyard with a short beak. aha...A Cardinal. This bird is smaller than that robin. The Northern Cardinal stands at 8-inches tall. This is a mixed deciduous/evergreen forest. A habitat is a place where an organism lives and finds its life needs. A habitat may be the area under a log or rock where a salamander finds its food and shelter. It can also be the stream where a brook trout finds oxygen and food. Birds may find a perfect habitat among the ridges and cliffs of the nearest mountain range, or the nearest skyscrapers and bridges in the city. There are many different ways to define a habitat based on the needs of the individual species. 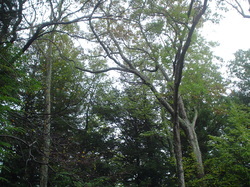 A forest habitat provides several layers of trees and shrubs along with living and dead (rocks and sand) materials on the ground. Perhaps you would rather live in a field among the tall grasses and low shrubs. How about a desert with limited rainfall each year and few plants to feed from. A riparian habitat is the edge of the water feature where it touches the land. One of the first steps in learning to identify a species is to identify the habitat in which you are standing. There are a multitude of choices. Could a bird survive here? Learn more about habitats from the National Wildlife Federation. Flocks of birds migrate together. One year / Four seasons. Some birds are year-round residents. They will stay in one location all year and put up with the changes in the weather and in the food resources. This is a tough life, but someone has to do it. Many other species of birds will move to a new location during the winter and spring seasons. This is known as a MIGRATION. Migration may take the form of a movement from the top of the mountain to the base of the same mountain (a longitudinal migration). A migration may be a short distance movement from one location to another. The shortest migrations are made by birds that breed in the southern United States and winter in Mexico or the West Indies, a trip which can be as short as a few hundred miles (Smithsonian Migratory Bird Center, 2012). Centre for Environmental Research and Education. (2011). Retrieved from http://www.cere-india.org/index.html. Cornell Laboratory of Ornithology. (2012). All about birds. Retrieved from http://www.allaboutbirds.org/. National Wildlife Federation. (2012). Create a Habitat. Retrieved from http://www.nwf.org/Get-Outside/Outdoor-Activities/Garden-for-Wildlife/Create-a-Habitat.